This book is an exact reprint of the 1950 Oxford University Press edition, with a new foreword by J. K. Elliott and a biography by A. M. Devine (Oxford University Press, 1950). 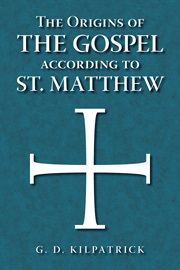 "A pioneering study on Matthew's Gospel, The Origins of the Gospel according to St. Matthew has stood the test of time and for the past sixty years has been regularly referred to and discussed in many a learned monograph or article on Matthew as well as in the standard commentaries on that Gospel. . . . Kilpatrick's investigation had revitalized and rejuvenated New Testament source criticism in general and Matthaean studies in particular."? ...he [Kilpatrick] has investigated independently and freshly every aspect of the introductory problems, and has made solid contributions towards the understanding of the gospel and its origins. Kilpatrick's book is a close and detailed study of a very difficult problem. In the course of it he has brought together a large mass of observations, which will have a usefulness beyond the very full use that he himself has made of them; and many who do not accept his conclusions will be glad to use his data in their own discussions. The Origins of the Gospel According to St. Matthew G. D. Kilpatrick Bolchazy-Carducci Publishing 1000 Brown St., Unit 101, Wauconda, IL 60084 9780865166677, $38.00, www.bolchazy.com The Bible was not a book written all at once. Each book has its own origins. "The Origins of the Gospel According to St. Matthew" is a reprint of the respected text outlining the history of one of the most vital books of the Holy Bible. More than a half century old, the scholarship stands well against the test of time, and offers insights on how the gospels became gospels and earned their place in the Bible. "The Origins of the Gospel According to St. Matthew" is a must for Biblical scholars, professional or amateur. This volume contains not only the reprint of the corrected 1950 edition of Kilpatrick's classic work on Matthew's Gospel but also a two-page foreword by J.K. Elliott, a list of his writings (compiled by Elliott), and a seven-page obituary of him by A.M. Devine (originally published in Classical Bulletin 65  111-114). After a seven-page introduction, his investigation of the origins of Matthew's Gospel discusses the documentary sources, the peculiar narratives, the liturgical background, the liturgical character of the Gospel, and Gospel and Judaism, the community of the Gospel , and the Evangelist. Kilpatrick (1910-89) was professor of the exegesis of Holy Scripture at the University of Oxford, and this work was the published version (first in 1946) of a thesis submitted in 1944 to the University of Oxford.